In the previous post we built up the objects that will surround the central domain object, i.e. Loadtest. We saw examples of entities and value objects. We are deliberately keeping the objects simple so as to keep the size of the demo manageable for a blog like this. Always keep in mind that real-life domain objects will be more complex than those but our main goal is to concentrate on a small section. In this post we’ll connect the dependent objects with Loadtest. We’ll also look at two new concepts from DDD: associations and standalone classes. In turn each of the above objects will have a property pointing back at the owning Loadtest object. Or in fact it would be more complex as e.g. an Engineer can work on multiple load tests and an agent can generate the load for multiple load tests. …will fail with a null reference exception. The problem is aggravated if a Project object references other domain objects. You’ll need to populate them all as well. What does that mean? When implementing associations in code it can be difficult to find the “correct” direction. An object somewhere in the middle, such as a TestResult in the above example, is especially problematic. If we load a test result then we also have to load all the objects below and above it in the object graph. So, how do we decide which direction to keep? There are no well-defined rules here I think. One can argue about the importance of both directions: we must be able to find all projects of a customer. However, finding the owning customer of a project might be just as important. In some cases, like the one quoted above with the US presidents, you’ll be able to make a sound judgement based on some basic reasoning or the business case. In other cases you can discuss what the end users expects to see, i.e. what the UI specifications look like. You might discover that one of the directions is not as crucial as the other one. In our case being able to view the “components” of a load test is more important than the way around. It’s more important to know which load test agent carries out a specific agent than which load tests a single agent has executed. Also, it’s more important to know the steps of a load test, i.e. the scenario, than which load tests were executed for a given scenario. Now we know that we’ll go for a unidirectional traversal. Next we need to decide the degree of coupling. Those are quite clear guidelines from Eric Evans. Keep the number of tightly coupled dependencies at a minimum. We have sorted out an important central object in our domain model. However, we haven’t seen the aggregate root yet. 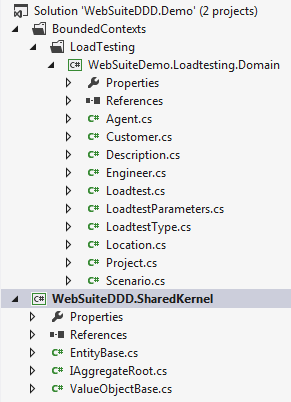 The Loadtest entity is a good candidate but there’s in fact another object that lies higher up. We’ve already mentioned the timetable which holds all load tests. We’ll discuss that object and its role in the next post. How would I then refer to multiple customers? Would IList be in terms of DDD? How would I then refer to multiple customers? Would IList be acceptable in terms of DDD?